So, we've done a lot of little things around the house. Some landscaping, some painting, lots of donating to Goodwill and trying to organize. 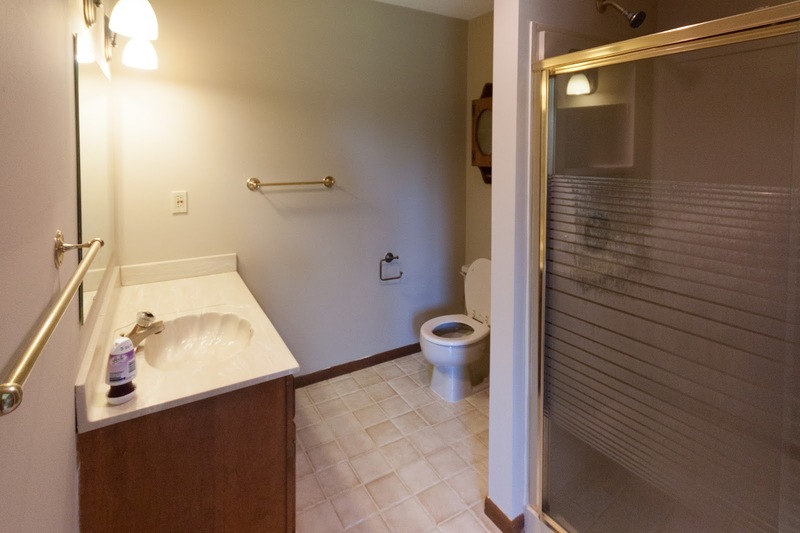 But one thing that has been on my mind constantly is our completely tragic, 1980s almond and brass master bathroom. The shower surround or door. The toilet - because it works just fine, we don't know how far the floor goes underneath, and it would look weird to have a white toilet in the sea of beige. The horrifying shell counter. 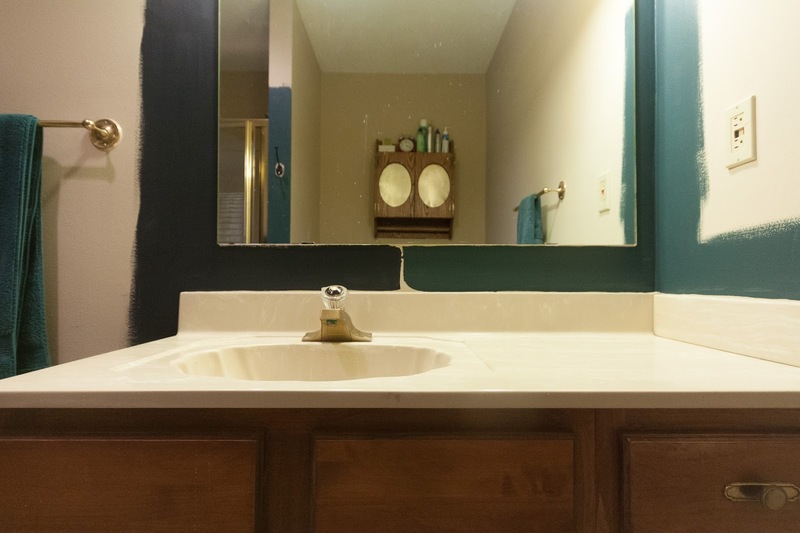 A counter is just too expensive right now, and I hate that the sink must be off center on this cabinet...so I want to wait until I can replace the vanity and the counter with a centered sink. 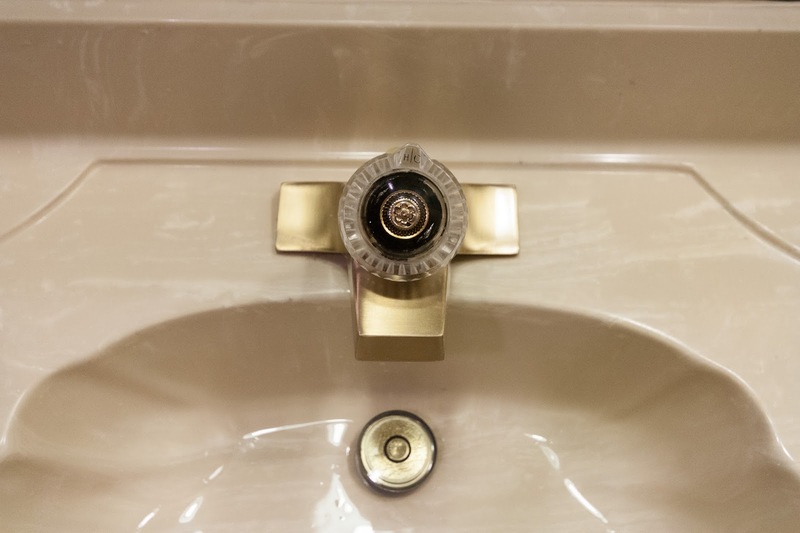 The super fancy brushed gold faucet, because I don't want to buy a NEW gold faucet and any other finish would look weird. The horrible beige wall color. 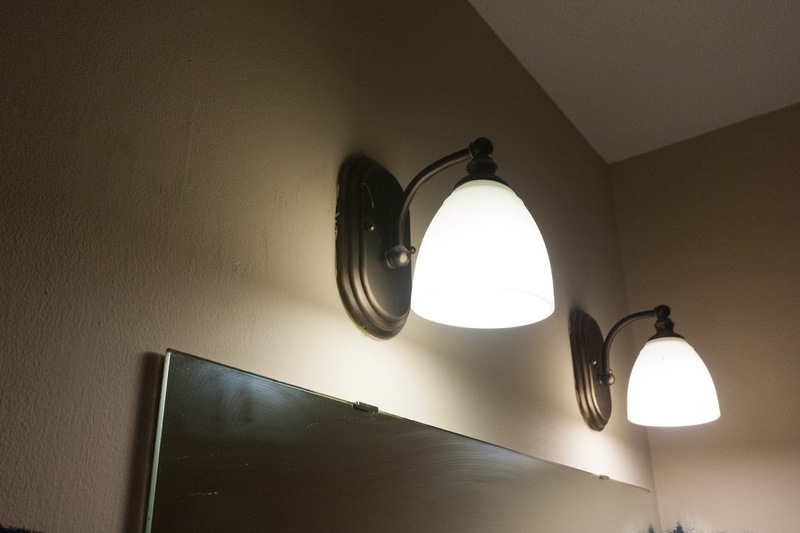 The sconces. Oh, they are so boring and too dim. The vanity hardware - but I'm not painting the cabinet. The TP holder and probably the towel bars. 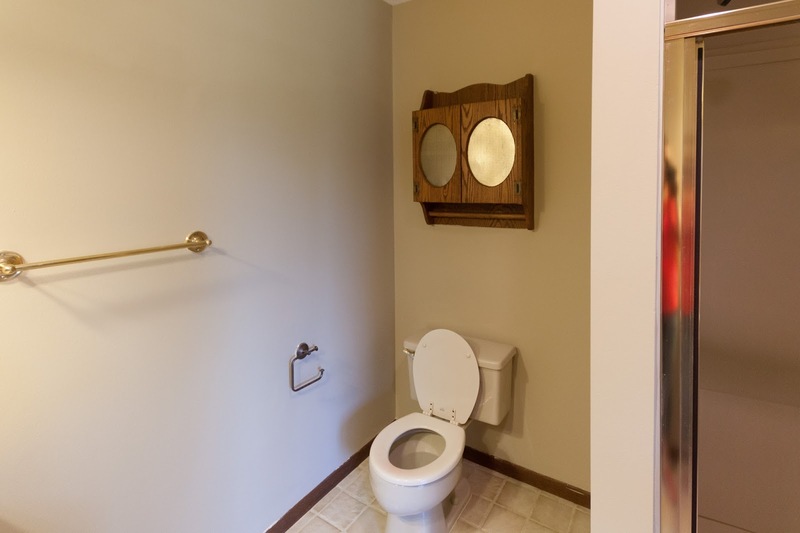 Most likely the storage cabinet above the toilet, although I secretly love the gold metal screening in the doors. 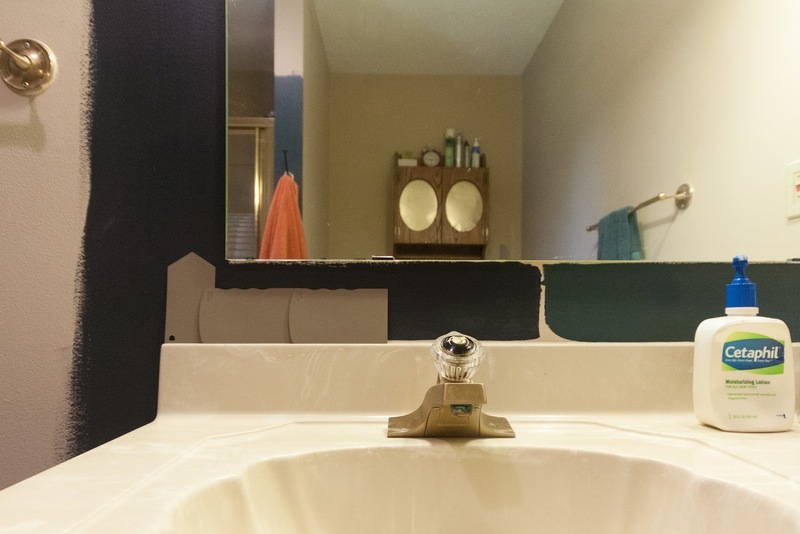 With an almond bathroom, you have to go dark on the walls. You need to make the almond seem less 'dirty' and so there is no light color I could think of that would look good. At first, I tried the color from our kitchen in the last house, because I had a sample container laying around. It is Behr Lotus Leaf. No like. It doesn't look too bad in the photo, but it looked very 'old lady pastel' in person with no natural light. Then I got inspired and put up my favorite deep color swatch, Benjamin Moore Hale Navy. I just love this color, and I knew it would look great with the almond. This is the same exact white balance in both photos, but the navy makes the counter look so much less yellow. But it's so dark, and I worried about the room looking black. So I pulled out my other swatches, and saw another deep color I liked. 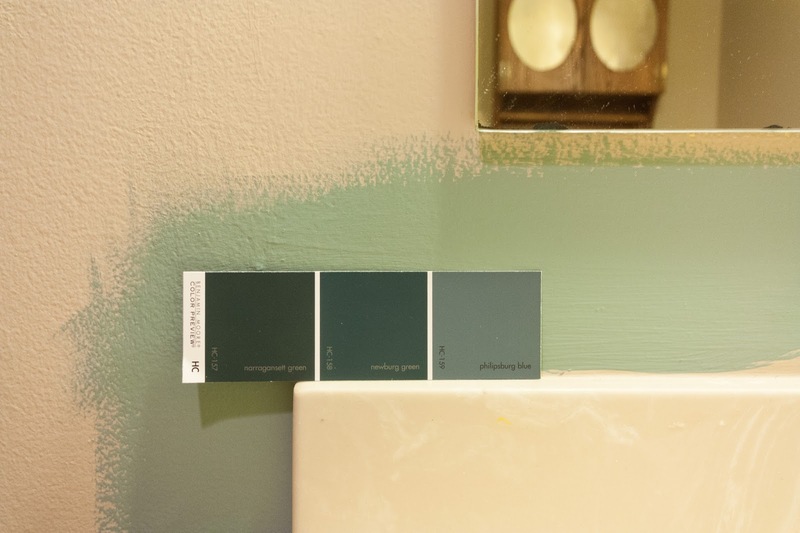 Benjamin Moore Newburg Green, which is a green teal - the middle one in this swatch. I love the way the navy neutralizes the yellowy counter, but I also think the green looks nice, and that color wouldn't read 'black' on the walls of this windowless room. On the toilet wall, I liked the navy better and was a little worried that the green might look HUNTER green when it was put everywhere. 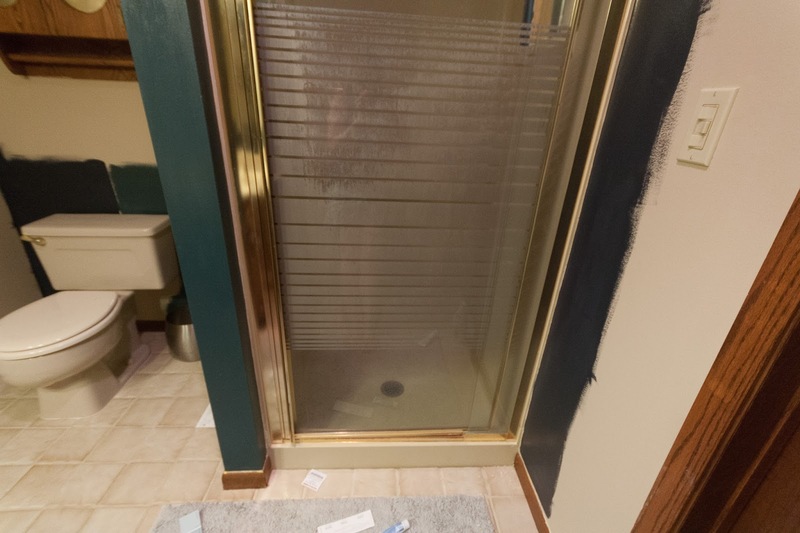 Before I could paint around the shower, I had to remove all the old paint people had slopped on the surround. My nail worked great. This is why I don't get manicures, people. What do you think of that screaming bright yellow they had in here before?! Yikes. 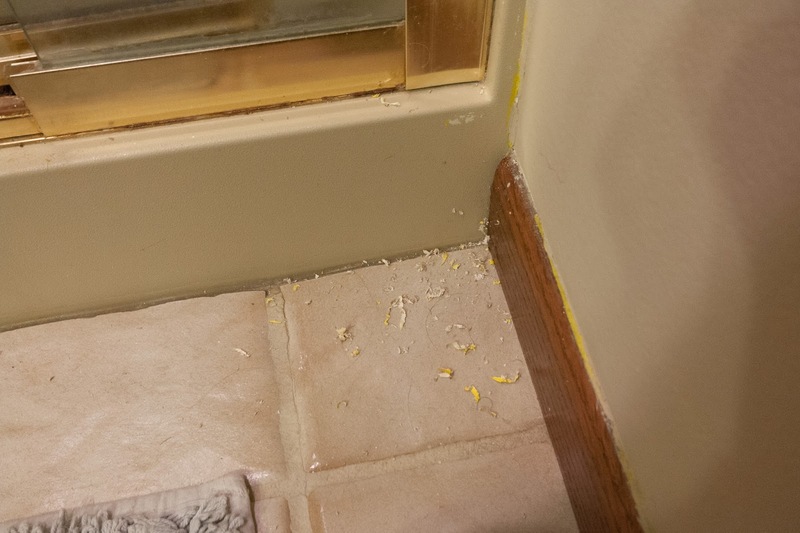 I had an impressive pile of paint shavings when I was done scraping. PS - I did this a week ago and the shavings are still on the floor. I have priorities, you know? I LOVE the green next to the brass shower door. 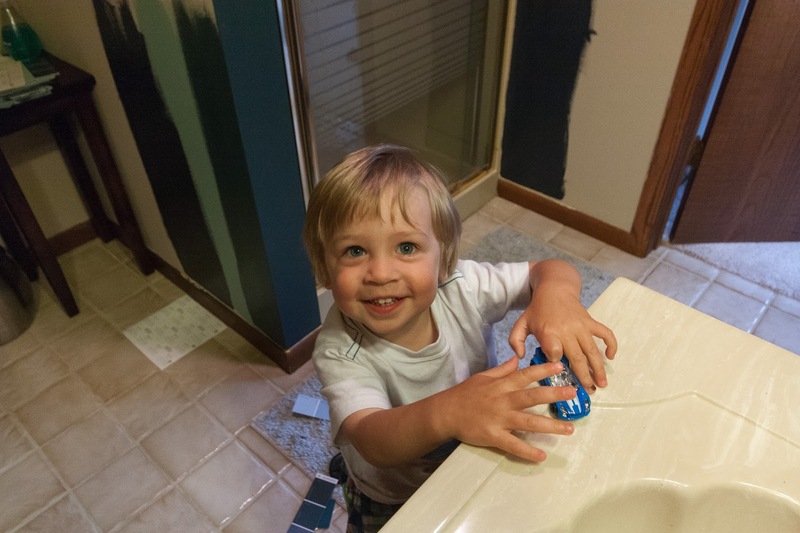 Ashford didn't have any opinion on the colors, but he likes to roll his cars on the ugly counter! Here is a tie back from the curtains I'm currently using in our master bedroom. It's a great match, which was a total accident. I also have a lot of teal towels and accessories already, but nothing that would look good with the navy. 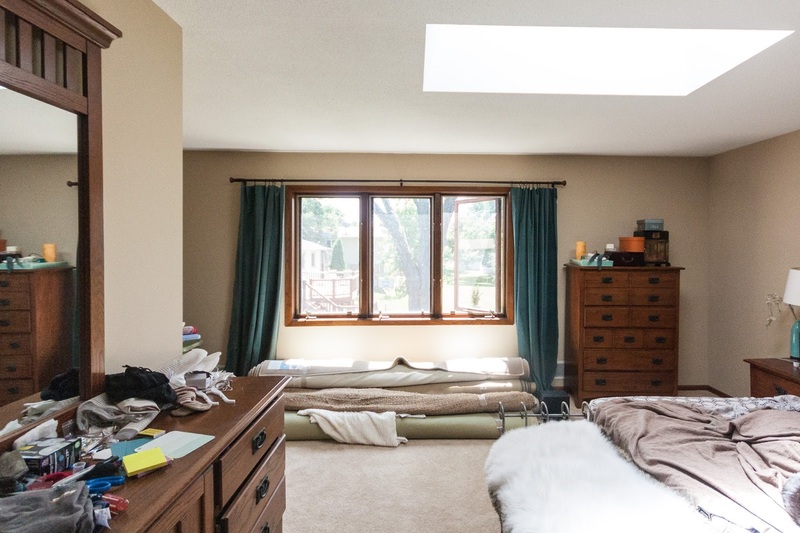 And as a side note, here is what our bedroom is looking like these days. Still a hot mess! I have no idea what color to paint this room. My goal in the bathroom is to make it dramatic and a little over the top. I want to embrace the shiny brass and almond and make it as fabulous and intentional as possible. I've always thought that a dark room works better with deeper wall colors, rather than trying to use light paint to brighten it up. And since I have this ugly yellowy counter, I can't brighten anything with white trim, cabinetry, etc. I'm going to get brighter, sleeker gold sconces, some pretty linens. Some nice wall art. I will clean up the vanity and make the wood look great again. And I will figure out what to do with the wall cabinet, whether to replace it or somehow make it less dated. 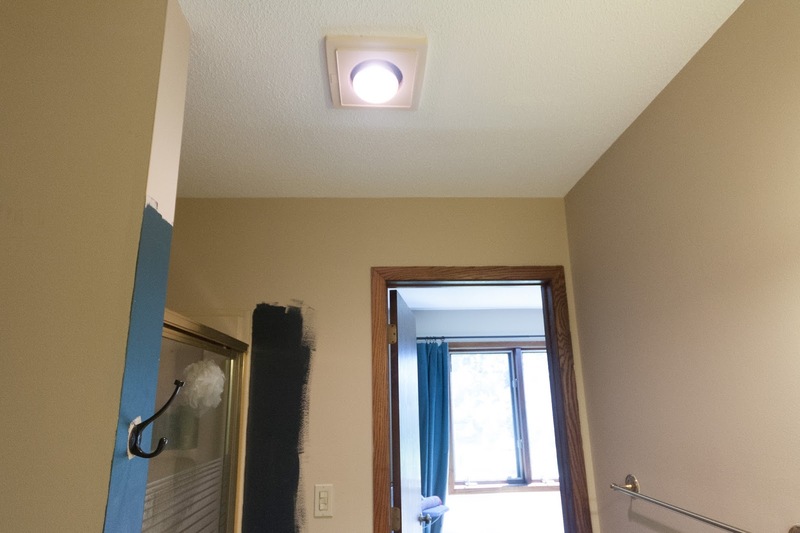 There is a recessed light on the shower fan, so there is a little more light than just the sconces. But it will still be dark in here. I'm considering (someday) replacing the hollow door with an opaque glass door to let some of that wonderful window light into the bathroom. We could also do a solar tube, but that is $600 or so we don't have right now. Do you like one color over the other? Do you think I'm crazy to go so dark in the bathroom? I did consider more neutral colors like warm grays, and I was just not impressed. This is Sherwin Williams Foothills, and it is just so blah with the counter. Team navy! The teal just reminds me a bit too much of the plaid couch my parents had in the 90's. Navy for sure! More drama with a classic vibe is the way to go. I agree that the teal is a bit 90's. Good luck and hugs from Sara in Sweden! make it another vote for navy! I like the navy. With the brass it feels a bit glam nautical. Yeah, navy is my vote too. Oh my gosh you guys, my mom had the teal country couch in the 90s, too! Thank you so much for reminding me...I can't do that color now! Go with your gut...NAVY it is! But beware, it is a tough color to paint with. Lots of pigment in it...very thick. Just beware! I also think a charcoal gray would be nice too. Let's talk about your little guy. First of all....he looks so grown up. Growing way to fast....slow down!!! He is so cute. Keep on with your projects. You will get there! Let us see the update soon. Sara, I love your ideas!!! Also, we found a cheap vanity top for our master bath on Craigslist for $40. Have you looked there? I like the navy color best. 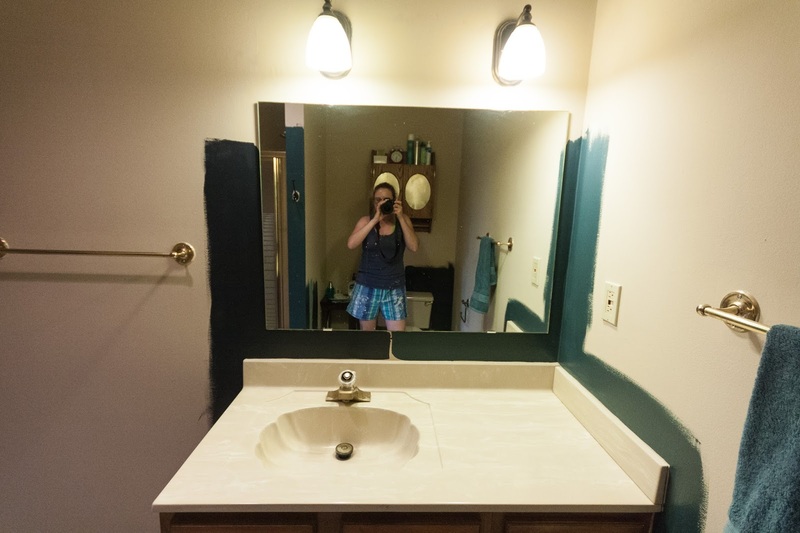 I know you're not wanting to paint the vanity, but we're in the process of redoing our guest bathroom on the cheap and I'm attaching a link that I hope works... of a before and after picture. It may not be your style but it might give you some inspiration. We did it all for under $150. Hi Sara ... looks like I am a team of one. Love the teal. Dark, but brighter than the navy for a room without windows. I'm afraid the teal would look too 80's or was it 90's? I'd go with the navy, but perhaps a grayer navy? How about a different mirror - something modern and snazzy like a gold starburst might make the other gold things look more intentional? If you went with navy, you could accessorize with hot pink. I dunno. 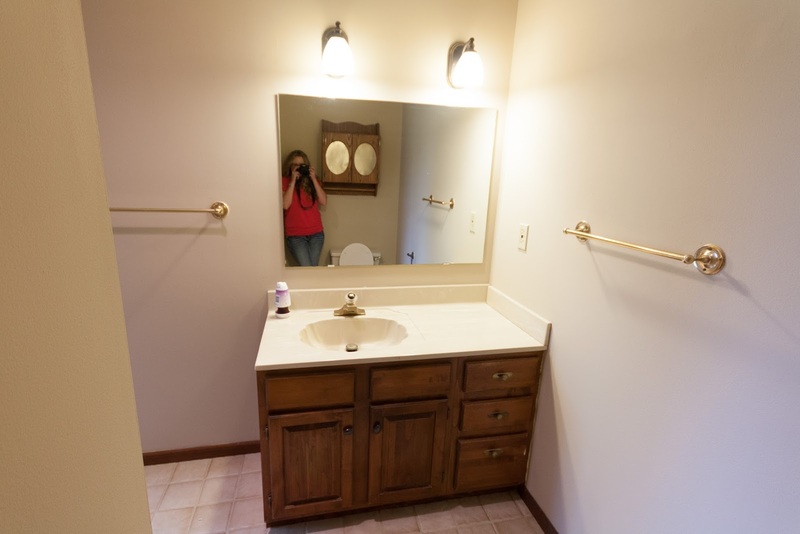 That's a tricky bathroom for sure. I would absolutely paint the cabinets. Try and figure out a way to make the cabinet door less 80's-90's? I think the gold will look fabulous when it is paired with some funky accessories. This is the issue I am having, why did people want almond fixtures? I didn't realize they wereally so cream colored until after painting [cover bright orange with gray made me realize quickly. I love the dark colors with the brass. My hubby is so fearful of dark paint. Our bedroom is dark brown, but it was the sellers choice I would love to do navy one day. I live both choices you've picked but I am partial to navy. My vote is the navy as well and just to throw something else in there, try a deep grey. 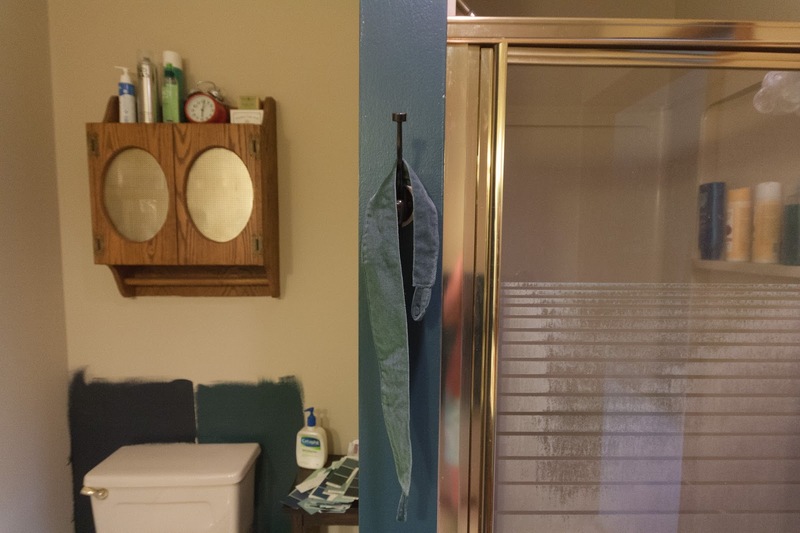 Lowes Valspar Beige Shadow is a charcoal grey in one of my rooms that gets very little light. The carpet is "almond" and looks good with beige and white colors. I like the teal, but if you're leaning navy now then maybe go a shade or two lighter? The Hale Navy seems like it will be too overwhelming and read as black once the entire room is painted. 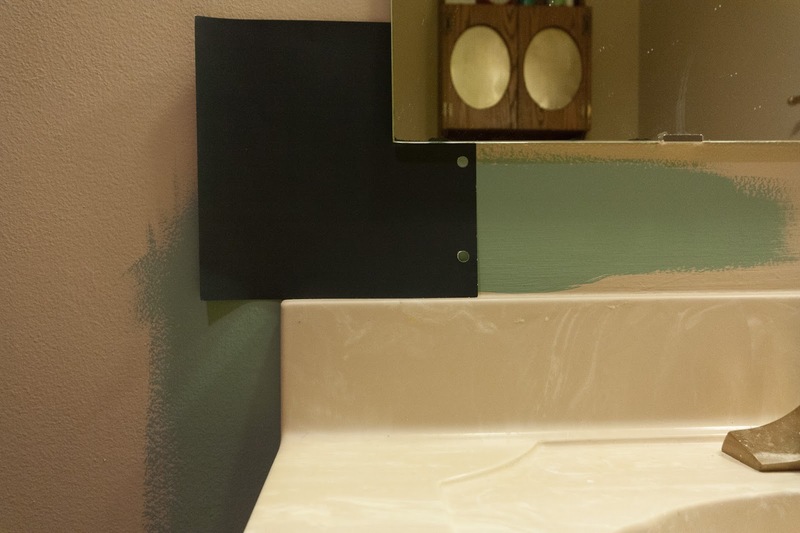 I'm planning to use Valspar Hotel St Francis Spirit Blue in our master bedroom soon, but Valspar Quarry Pond, Pantone Moroccan Blue and Valspar Fairmont Penthouse Mosaic Blue are other very nice navies. 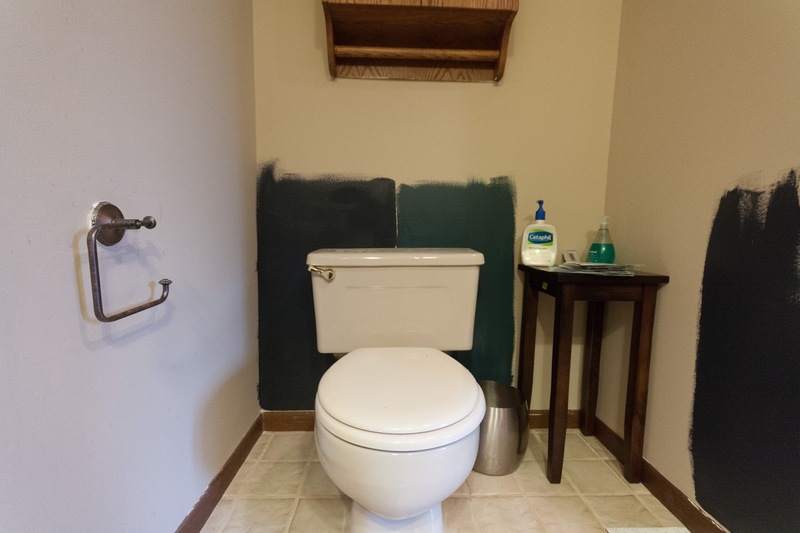 Also, Casey at Waffling Blog has another windowless bathroom with dark paint. 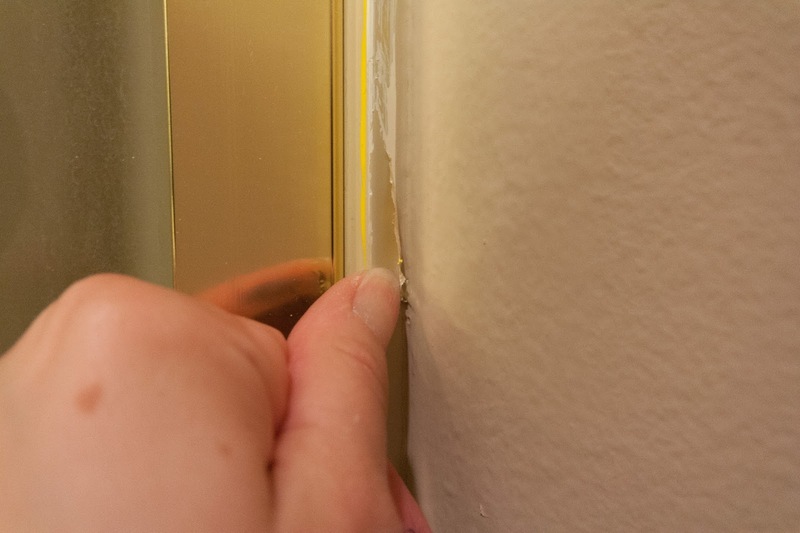 She replaced her counter and medicine cabinet last year, too. We are in the same boat. The bathrooms need to be redone here, but they're functioning, so they aren't too high on the list. But I haaaaate that they are beige. Oh wait, one has advocado fixtures. My bad. She also did horizontal beadboard, so it brightens it up, but you get an idea of the color in a windowless bath. I hear you--our whole house was band-aid beige and shiny 80s brass when we moved in. I've managed to paint away all the beige, but the brass remains (in pretty much every room). I'm going to vote for the navy, although I think they both work. 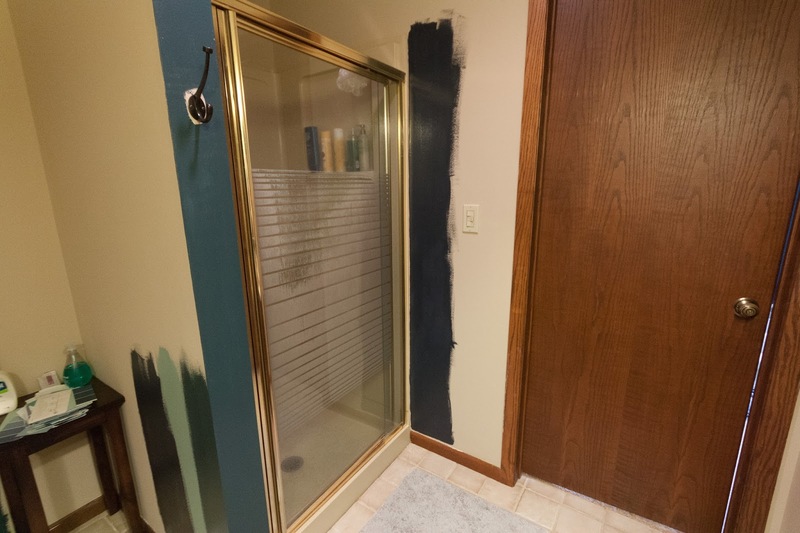 When I first saw the brass shower door I thought, "you could totally glam that up by keeping all the brass and paint the walls black!" Definitely navy. I think you're right that the green will look too hunter. I prefer the navy myself - but I do like the green next to the shower. go with navy. add some red accents. if you want to break it up, add a dark gray accent wall so the room doesn't feel too small. looking forward to what you pick! Navy for sure. Have you considered taking off the shower door and just going with a shower curtain. 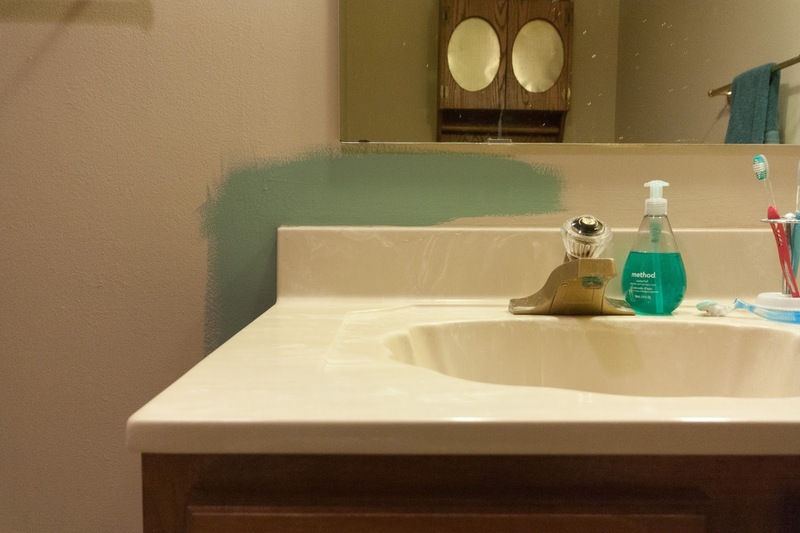 My parents did that as a quick fix in their bathroom-it did wonders for the bathroom.